This project teaches you how to widen your range of vocal variety. The goal is to use volume, pitch, rate, add meaning and interest, pauses. Personally the biggest challenge was that I already tend to get good feedback in terms of vocal variety but I wanted to get out of my comfort zone and try things that would normally make me feel a bit self-conscious. Choose a topic for your speech that you are passionate about. If you have strong emotions you will find it easier to play with volume, rate or pitch. Meet with your mentor or a friend to practice your speech. Even if you haven’t memorized it completely, a second opinion will be very useful in terms of the words or phrases you should lengthen, shorten, or play with. My mentor’s feedback was invaluable in this sense. He gave specific advice on HOW to say certain sections and when to add silence for dramatic purposes. If you have trouble memorizing your speech, divide and you shall conquer. I found that even though I lived this experience, reflected upon it for a while and wrote the speech myself, it was still hard to memorize (and thus to practice it afterwards) because I chose the words very carefully and I didn’t want to deliver my speech haphazardly (it makes me waste precious time). My strategy then was to divide the speech in sections and give them a short heading. But it had to be something specific (avoid intro, body, conclusion) such as farmer with accent, or woman and seeds, or my science experiment. I memorized this short mental map with its key words first. then I went section by section, and then I tried to link it up. When i noticed that some sections were still weak, thanks to this structure I was able to review specific segments without losing details or connectors. Record yourself. Whether you prefer video or just audio, the feedback you’ll get from hearing and seeing yourself will help you point out the things you like and can enhance and the things that need work. For example, I once got several feedback forms saying that sometimes I looked up too much. It wasn’t until I saw myself in a recorded practice that I realized how that looked to the audience and I managed to change it. You will also see if you sound monotonous or too fast. If you are feeling brave you could even listen to your recordings with somebody else and write down their comments. I hope you enjoy project number 6 as much as I did and that you get some valuable tools to enhance your public speaking skills. Below you will find the speech I wrote for this project. A few weeks ago I went to Norway to work as a volunteer interpreter for an international movement called La Via Campesina. They fight for food sovereignty and for the right of peasant farmers to produce, multiply and exchange their own seeds for free. “We produce about 40,000 liters of goat milk a year. If the milk is good quality, we sell it at 8 KR a liter and we set some aside to make excellent quality cheese. If the milk is not so good, we can only sell it for 4 KR a liter and we don’t even bother trying to make cheese.” As you can see, if the quality of the milk is not right, they only get half their income for the same amount of work in an entire year. The farmer then said that in order to produce good milk the goats needed to be healthy. He said that if they feed them mostly grass organically produced by them their goats almost never get sick and they get good milk. As a long-time city dweller, my knowledge of goats and seeds, I must confess, is very limited. However, this whole experience reminded me of a science experiment I did in the 2nd grade. Our teacher asked us to take a couple of beans and put them in a small jar on top of some wet cotton balls. She told us to water them every third day to keep them moist, to place them next to a window and to wait. I remember first checking on my beans and seeing that nothing was happening day after day. 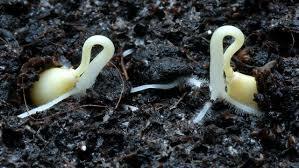 But then one day I saw a tiny white sprout sticking out of one of the seeds. I was so excited I went around showing it to everyone in the house. A few days later the bud grew and it became the root. Shortly after, the seed opened in half and two tiny leaves started to unfold. After a couple more days, the seedling developed and into a tiny plant and the seed disappeared. It was time to transplant it into a pot with good dirt. From then on I watered my plant every third day and just watched it grow in amazement. It got taller and greener every day. Shortly after it needed a stick so it could wrap around and keep developing. Then one day, it started to grow flowers. The flowers transformed into a pod, the pod grew and finally the plant gave way to new seeds. My visit to the goat farms in Norway reminded me of some very valuable lessons connected with seeds, with all seeds, but especially with my metaphorical seeds. Many great philosophers and poets have used seeds to teach us about the emergence of great potential over time. A humble kernel can grow into a huge tree that can even populate an entire forest if the conditions are right. In one of the talks I interpreted (about food sovereignty) I heard a woman from La Via Campesina explain how peasant farmers had selected their plants for centuries, choosing those which had larger fruits or more grains, and adapting them to different soils, climates and tastes. I really liked this idea because in life when we want to make something happen, we have to start by planting a seed. This seed can be a dream or a thought that you have to select and perhaps adapt to whatever cards life might have dealt you. Another important element, you have to make sure the conditions are right: the soil where you plant has to be full of nutrients (perhaps finding the right people to help you develop your idea, or the right partner to start a family).Then, it has to get plenty of light and air (productive thoughts, ventilation). Remember you have to water it every so often. This means that you have to write your to-do lists and get to work. And finally you have to do what my second grade teacher said with the authority of an elementary school teacher: be patient and wait. The waiting part may sometimes be the hardest part. Sometimes we want or need things to happen quickly, and when we go and check on our seeds, we see that the soil is just there. It looks like nothing is happening underground. At this point it is tempting to get impatient and to spray your soil with chemical fertilizers to try to help things a little bit. It might even be tempting to say, oh forget about this seed, it is taking too long, and go get a “genetically improved” seed that will perhaps grow faster, but… beware. The fruit produced by a seed that was modified may not be as tasty, it may just taste like foam. It might grow faster and yield a couple more apples, but then you may not be able to use those seeds again. If you added a ton of fertilizers, your fruit may not be as safe to eat. The most valuable lesson that I learned from the farm in the frozen mountains of Norway, is not only that baby goats are really cute and they’ll produce great milk if you feed them right, but also I learned that your own ideas, your projects, your seeds, are valuable. Be convinced of their potential.